Wild rookie Jordan Greenway figured he’d sink into restful sleep Sunday night after rattling off three games in three nights, but the forward wasn’t complaining about the busy schedule. After reporting to Iowa of the American Hockey League Friday for a two-game stint to recapture his confidence, Greenway rejoined the Wild Sunday as planned – getting on the ice with the group in the afternoon at Rogers Arena in Vancouver where the team will embark on seven straight road games starting Monday against the Canucks. 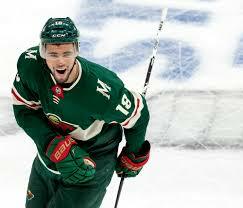 He returned to his previous spot on the third line, working alongside center Charlie Coyle and winger Matt Read. Joel Eriksson Ek, who played alongside Coyle and Read while Greenway was absent, skated with the fourth line. Time will tell if the brief detour to the minors stoked Greenway’s swagger enough for him to start making an offensive impact in the NHL, but coach Bruce Boudreau noticed Greenway was happy to reunite with the team. While with Iowa, Greenway scored a hat trick in a 6-1 win over Colorado Saturday and put five shots on net during the two-game tune-up – this after he managed just one assist and eight shots in nine games with the Wild to start the season. The 21-year-old embraced the challenge and focused on unleashing more shots, and he believes the time he spent in Iowa will help him contribute at the NHL level.